THE Bulawayo Presidential Youth Interface rally is slated for November 4. The ninth and penultimate rally, like similar rallies held before, is expected to attract thousands of people from all the party’s wings. This will be yet another opportunity for First Lady, Grace Mugabe to rant against Vice President Emmerson Mnangagwa. The zanu-pf Youth League national executive led by its secretary Cde Kudzanai Chipanga announced the date yesterday at the party’s provincial headquarters, Davies Hall. The Youth League said it was happy with the province’s preparedness to host President Mugabe. Cde Chipanga said rogue war veterans, who have a tendency of insulting the party’s leadership and the First Family, were not welcome at the rally, which will be held at White City Stadium.Bulawayo youths suggested November 4 as the date for the rally and the Youth League national executive endorsed it, said the Youth League secretary. “If you want President to come on November 4, he will come on November 4. You organised the date. You have demonstrated that you are in the ruling party and that is what is going to happen. 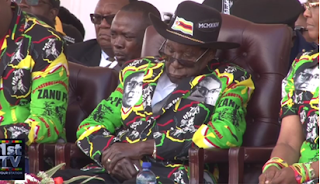 What is now left is that we go and tell President Mugabe that Bulawayo youths want him to come in the city on November 4,” he said, drawing loud cheers from the crowd. Cde Chipanga said the Zanu-PF Youth Presidential Interface Rally can be attended by anyone, except renegade war veterans. “As the Youth League, we work with the Women’s League; you can’t separate the youths from the women. We work together, and they will be joining us during the interface rally. As the wings, we also work with the Main Wing and in this province, it’s led by Cde Dennis Ndlovu. We are also inviting the Main Wing. We also work with war veterans, ex-detainees and collaborators in our programmes. There are however those rogue war veterans like Mutsvangwa (Christopher) and crew who insult the First Family and senior party leaders, those ones are not invited; they must remain in the cold until they repent. We only want real war veterans,” said Cde Chipanga. He said President Mugabe had donated 10 000 litres of fuel to assist the province finalise preparations, while the Youth League’s national executive had donated T-shirts and caps, which will be given on a first-come, first-serve basis on the day of the rally. Cde Chipanga said the province should scale up its preparations and on Monday, the party will deliver three tents that will be pitched at the venue. Earlier in the day, Cde Chipanga and his executive visited liberation war stalwart Cde Jane Lungile Ngwenya at Bulawayo’s Coronation Old People’s Home, where she resides. He described the visit as a revelation for the Youth League, saying Cde Ngwenya was pleased by their visit as she counselled them to stay disciplined. Meanwhile, the Youth League has also endorsed the Zanu-PF Special Congress scheduled for December, saying they support President Mugabe’s candidacy for 2018 elections, as well as the appointment of a female Vice President. “We understand that all the Zanu-PF provinces across the country made resolutions to compel the President to call a Special Congress. As the Youth League national executive, we also met and unanimously agreed and resolved that we support that resolution that President calls for the extraordinary congress come December,” said Cde Chipanga.